Oh so adorable card, love your papers ! Very cute, love the colors you used on the image. Those spring papers are so pretty. love it!!! love the little bunny she is holding too! too cute!!! Well you are so up on me!! I have not made a single Easter card yet. OMG I have been soo busy when I have been off from work between Brooke, the new puppy, relatives in town visiting,& have had to make a lot of Bday cards, still getting Thank You cards done from Brooke's 6th Bday party...I made her write them all out on the insides. That is VERY time consuming!! Well have an Awesome day! Hey, you gave her a Daba! So cute! WOW, super cute. So colorful and bright. Totally love it. een echt sweety voor de pasen heel erg vrolijk van kleur! This is such a sweet card! How creative to give Country Lulu some Easter eggs vs. farm fresh ones! Love it! Ah - such a fabulous easter card Amy. Fresh and happy colours and love the image. I love the idea of making Country Lula into an Easter Girl, so easy to do but I probably would've never thought of that! Saw your videos on this card and loved watching it all come together!TFS! Very sweet Amy! Those colored eggs are lovely and the cute bunny is a really nice touch. That is so cool, Amy! Fresh, sweet and gorgeous - love it! A very, very sweet and pretty Easter card, Amy! 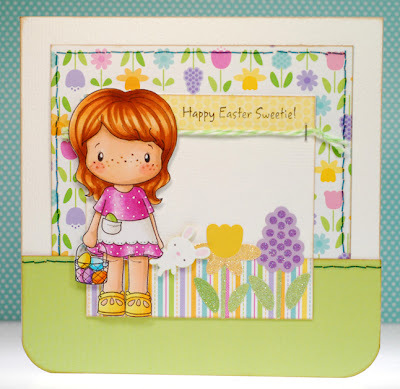 That Doodlebug paper is so pretty with all the spring flowers in soft pastels, and your Country Lula is just perfect! Look at how tiny those eggs in her basket and pocket are...and you color so neatly!!! I agree with Lisa above, LOL! This paper is so beautiful, and I always find new stuff on your blog that I. MUST. HAVE! Lovely card! I think you secretly own a scrapbook store at the back of your house, huh? How else would you be able to choose these fabulous papers :)? Awesome Easter card, Amy!